The death toll is now 111. Cuba's President Miguel Diaz-Canel, third from left, walks away from the site. ONE OF THE three women who survived Cuba’s worst air crash in decades has died from her injuries, the health ministry said last night, raising the toll to 111. Transport Minister Adel Yzquierdo has said one of the plane’s two black boxes had been recovered in “good condition,” and the other was likely to be found. Their data will be key to determining what happened. The accident happened at 12:08pm local time (5.08pm here). 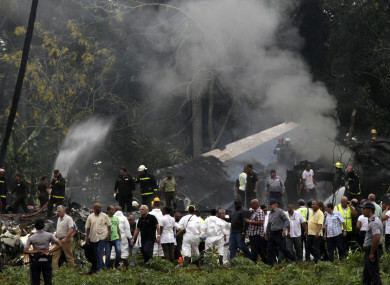 The plane crashed in a potato field close to Havana’s airport. Witnesses and airport officials told AFP that the aircraft plunged as it was making its first turn after take-off. A day of mourning ended early yesterday, the Communist Party leader and former president Raul Castro said. Flags were flown at half-mast throughout the country. Email “One of three women who survived Cuban plane crash dies”. Feedback on “One of three women who survived Cuban plane crash dies”.